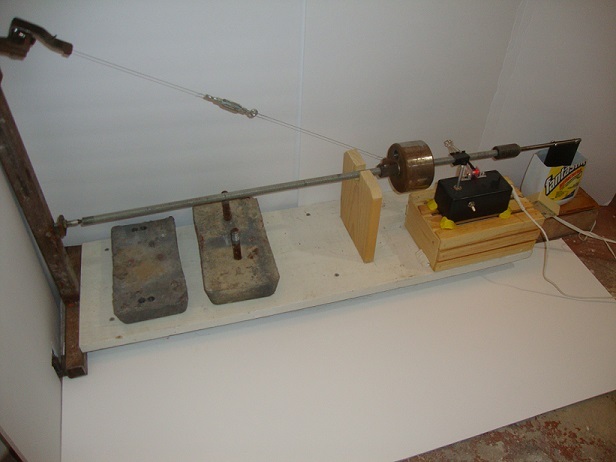 Modern (since the 1980s) commercial broad band seismometers are three dimension, force-balanced (use electro-dynamical feedback) and are smaller and much easier to install and operate. Examples are here, a leaflet (local copy). "Unlike traditional seismic sensors, molecular-electronic ones use a liquid inertial mass." A Seismology History from USGS, (local copy) including that in the early 1900s, "B.B. 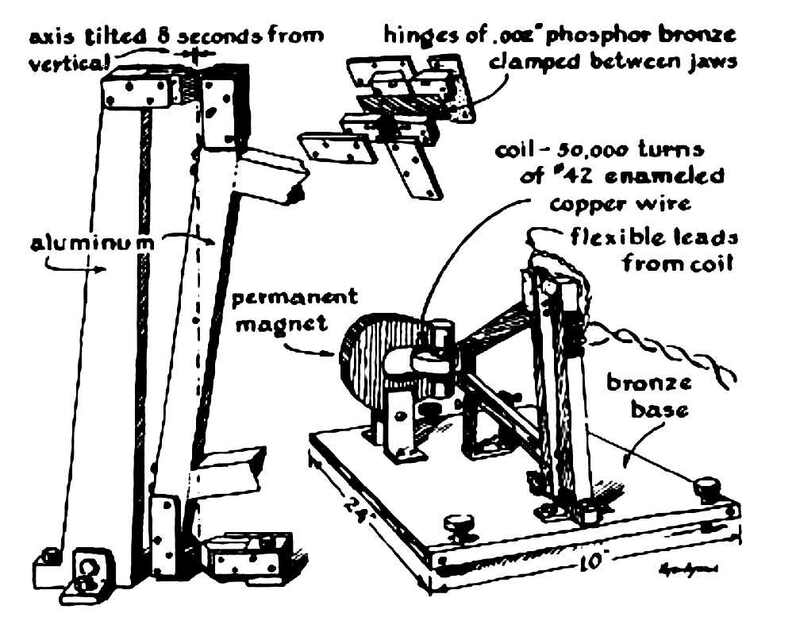 Galitzen develops the the first electromagnetic seismograph ..." widely used even today, and discussed in this paper. What style and direction sensitivity to build? 3) A recorder, often this popular helicorder, which graphs the electrical output, which adds timing marks from a clock synchronized the radio time signals ( WWV ) accurate to about 0.1 seconds. Or more recently, a computer which stores, displays, and analyzes the digitized seismometer output, which incorporates time signals from GPS accurate to 0.000001 second (actually better ;-)) . Our family moved to California - "Earthquake Country" - in 1970. Having read a number of "do-it-yourself-seismology" articles in "Scientific American" and hearing of a nice integrated circuit amplifier, I started building. Soon I had a seismometer, an amplifier (I was an electronics junkie), and a then a recording unit, all working well. I told my Los Angeles cousin Rita that I was interested in seismology - Rita had gone to school with Tom Sanders of Palo Alto. Tom was interested in amateur seismology. and was the current treasurer and also editor/publisher of its quarterly journal. Tom tired of publishing the WASS journal, and offered me the editorship - I seemed the only "victim". After about two years of rather solitary work, as treasurer, author, editor, and publisher, I too tired of publishing the WASS journal- but could not find a victim - and closed WASS. After a few years I "down sized" and gave the WASS notebooks of publications to Larry Cochrane of the Redwood City Public Seismic Network. I am a techie - encouraged by a gift of the monthly "Scientific American" magazine while in high school in 1946 - and a faithful reader of its column "Amateur Scientist" until about 1991 when the liberal arts types ( who didn't seem to know high school science ) took over the magazine, and the "Amateur Scientist" column was no longer supported. One of many fascinating articles in "Amateur Scientist" was how to build a seismograph sensitive in a horizontal direction to very low frequency waves, like a wave that takes 10 seconds. 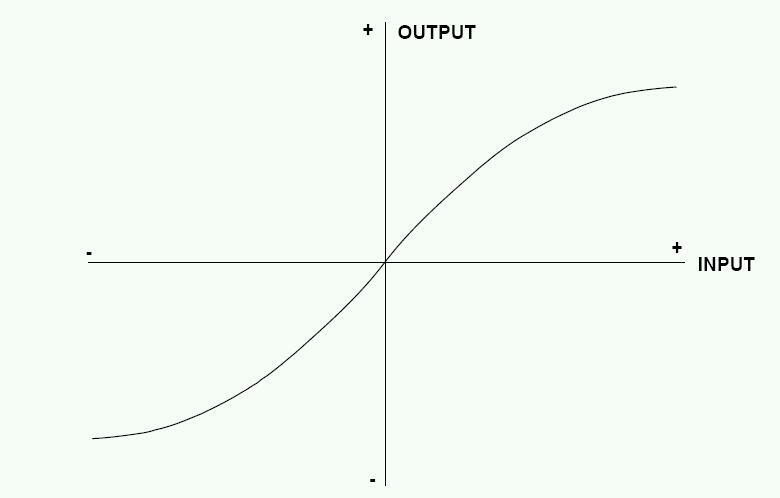 The output signals needed amplification to be seen an/or recorded. At the time, vacuum tube amplifiers were in, transistors flaky and expensive. The project seemed too much bother. We moved to earthquake country, lots of earthquake activity, in 1972, just about the same year a lovely little integrated transistor amplifier, the 741, became available, for about $ 2 instead of say $300 for the previous hot, power hungry, troublesome, vacuum tube direct current amplifiers. The drawing to the left, from the British Geological Survey. I had heard that making a long period vertical seismometer was is a major engineering challenge :-( , so lets see if we can build a longer period horizontal instrument sensitive down to 1/20 Hz, (wave per second). I had studied the following "Amateur Scientist" articles in "Scientific American"
describes a Wood-Anderson torsion seismometer - owned and operated by Harry H. Larkin, Jr. Note that C.L. Stong calls this type of seismometer "Galitzin" after its inventor. 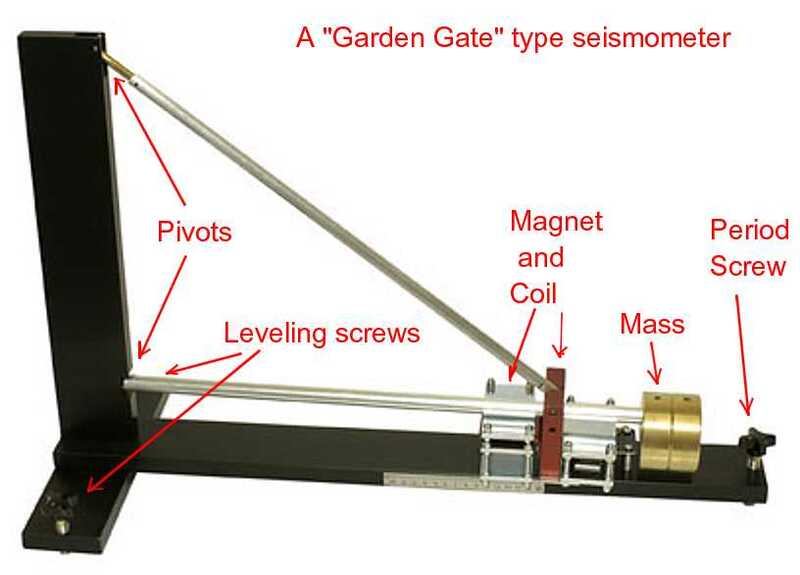 The "garden gate" type horizontal seismometer ( the sensor of a seismograph system ) seemed promising, reasonably simple, and the "Scientific American" articles had shown examples. There is also the "style" of the sensor. 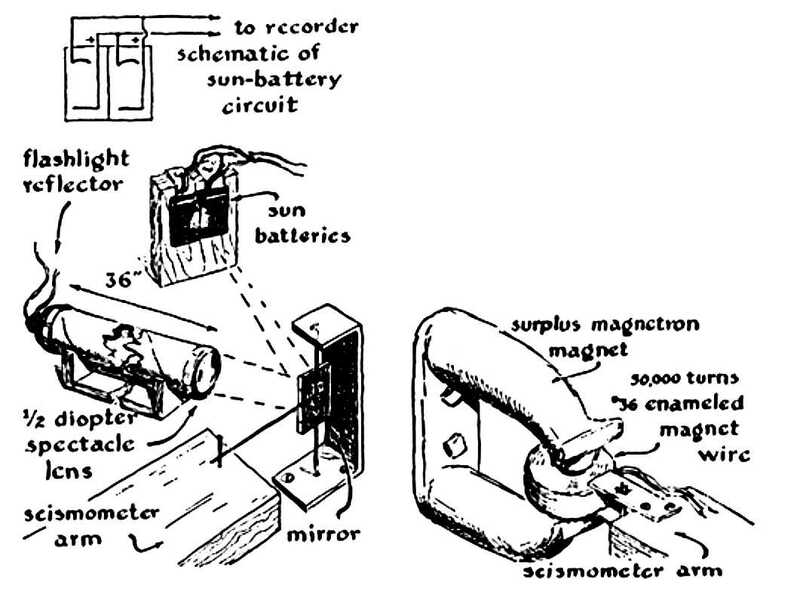 One of the early seismometers used a mirror on a wire. The mirror would be an inertial mass twisted by the wire shaking with the earth. 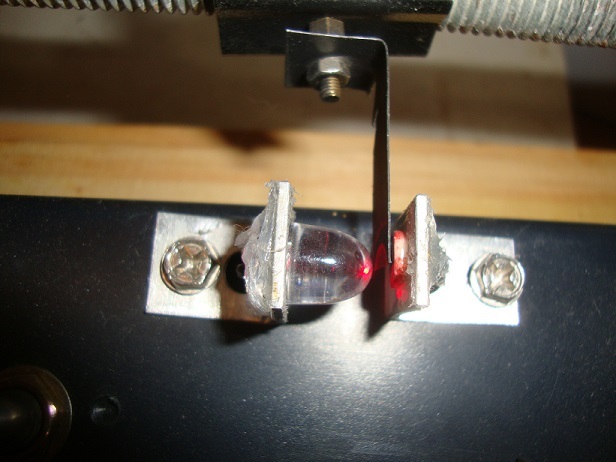 A beam of light bouncing from the mirror would darken moving photographic film to record the earthquake. 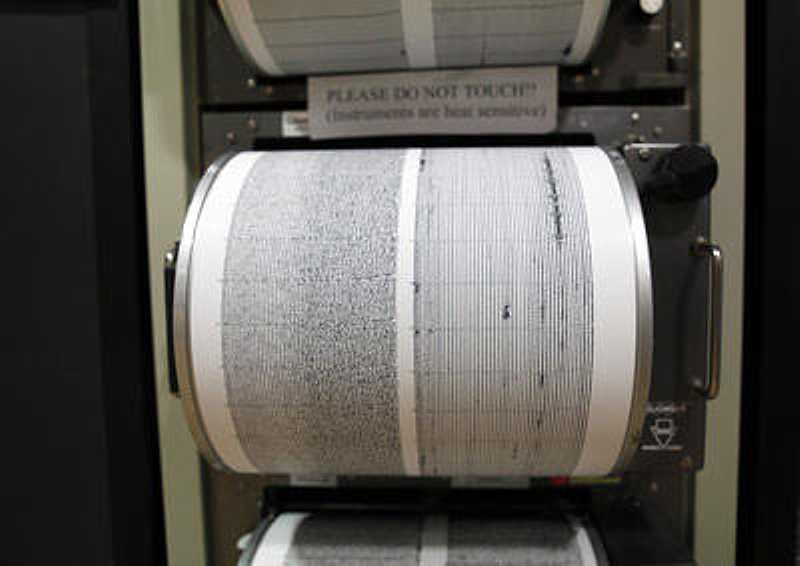 This system was used by Richter to define the "Richter Scale". Using a coil interacting with a magnetic field is widely used now, in part because of availability of convenient and stable electronic amplifiers. 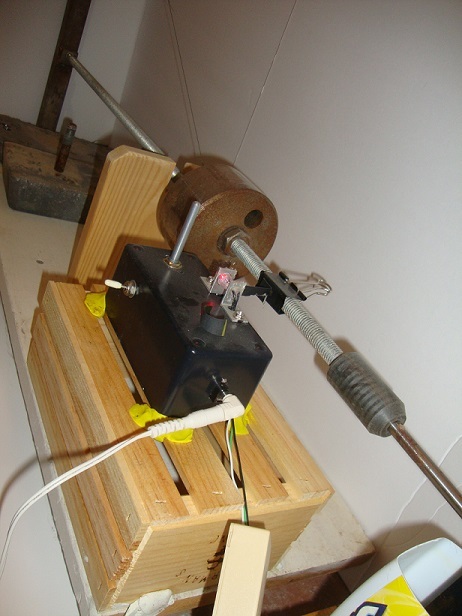 It is easy to get a signal from a coil near a moving magnet, * but * to get a reasonably linear calibrated output over a reasonable range of movement requires some engineering and care - well beyond the scope of this little paper. 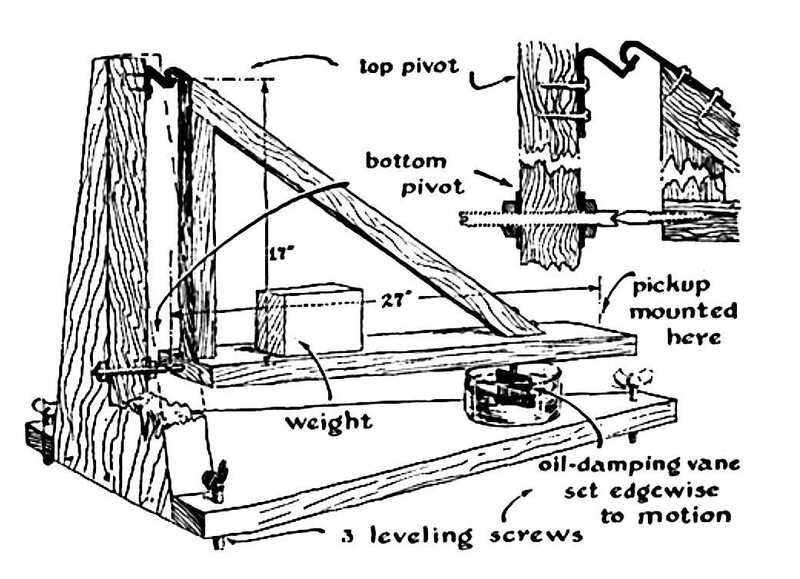 OK, now we are into it - the goal - a home built "garden gate" type horizontal seismometer with as long a period as practical. The long dimension of the base is usually about 18 inches for convenience. Adjusting the Period Screw adjusts the period of the swing. The Leveling Screws help position the magnet in the coil assembly. At 15 second period, 1/32 of a turn makes a significant difference. The pivot details are not shown here, but are critical to successful performance. Another requirement is that all structures other than the pendulum have mechanical resonances damped and at a frequency well above the highest of interest. I made my frame from 1.5 inch copper tubing using a 4 way junction - easy, nice - the pendulum L shaped of 1 inch copper tubing (no diagonal bar). 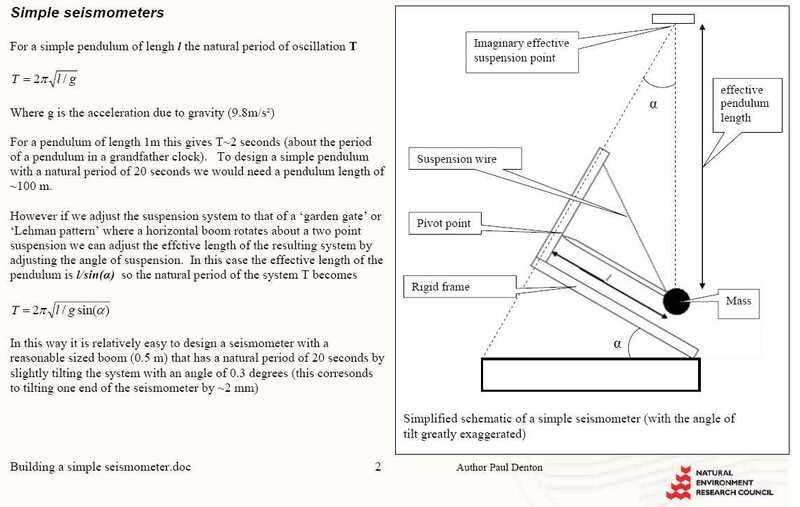 b) Adjusting the period of the pendulum. These adjustments interact somewhat, as the period gets longer the leveling gets touchier. c) Use flat smooth material (window glass?) under the screw points. 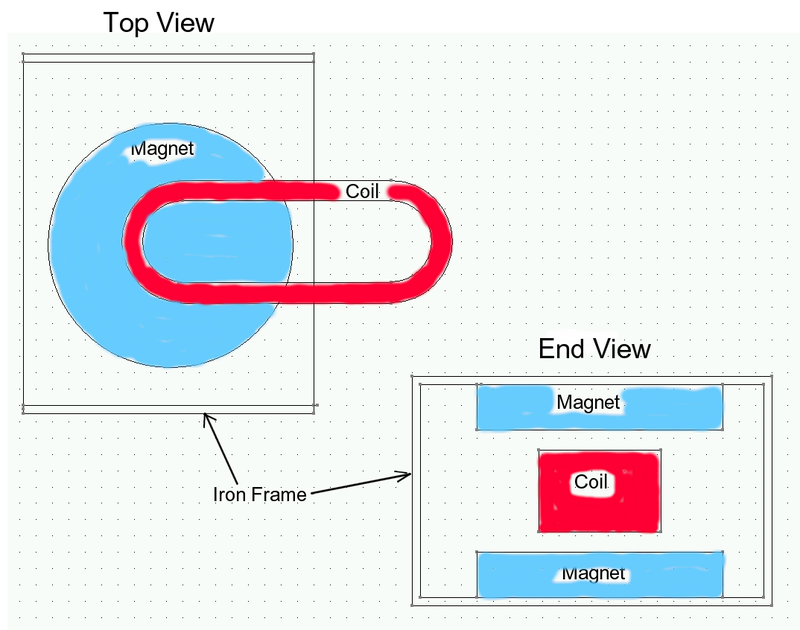 Choice of moving magnet or moving coil ?? Many people put the magnet on the moving boom as part of the mass, and place the coil on the fixed frame. I worried that moving iron near by - such as an automobile if the seismometer is in a garage that is used. I put the coil on the moving boom, and the magnet on the frame, hoping that a moving car near by would not cause as much false signal. But you are faced with passing a pair of very fine wires near the upper pivot. There is a concept of "Critical Damping" that is interesting ( external ) study. To achieve approximately correct damping various methods are used. Some older seismometers had a little pan of (motor) oil on the frame, with a little vane positioned parallel to motion, in the oil. This would absorb the energy of the swinging pendulum. 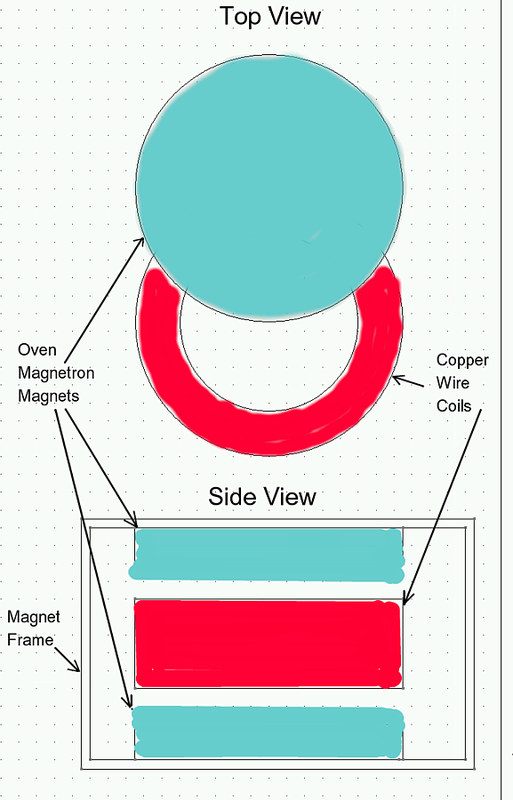 Another possibility is a vane of conductive material ( aluminum or copper ) in a magnetic field, maybe a separate magnet to prevent interaction with the sensing coil. Adjust the position of the conducting vane to achieve correct damping. A currently widely used damping system is to use the power generated by the sensing coil to be dissipated in resistance in the coil and a resistor in parallel with the sensing coil. Since different resistance is required for different conditions, and a the usual variable resistor can be noisy and unstable, I use a selection of fixed resistors and an alligator clip lead. 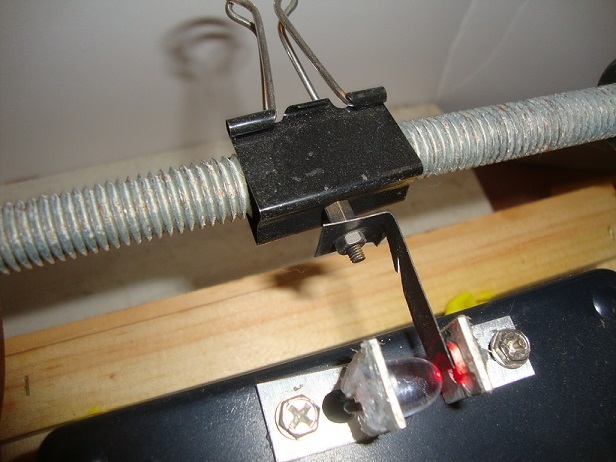 The resistor assembly can be fastened to the seismometer frame for convenience and easy adjustment. 10 % Resistors in the series from 10 K to 200 K should be just fine :-)) standard values, comment, Or you can start with a 200 K potentiometer, "audio taper", for a start. See further discussion under adjustments. Also related to location is the seismometer should ideally placed on or in an enormous rock. Soil expands and contracts and tilts with changes in humidity, gets into your equipment, and is your enemy. Most of the rest of us must compromise - I placed mine on the garage concrete slab in a corner. Oddly, the car movement did not disturb it noticeably, but when the weather changed from dry to rainy or rainy to dry ( California climate cycles ) the concrete corner tilted and the seismometer needed frequent ( weekly ) re-leveling. Also, there was a train that ran twice a day about 5 blocks away which I could "see" seismically. Another annoyance is the wave action on an ocean coast. This is reputed to generate the "microseisms" of about 1/7 Hz. I was about 20 miles from the coast, but during winter storms the "microseism" noise ruined most of the fun. I tried to make a 1/7 Hz "notch" filter, but that is another tale. This is the basic scheme, does not describe all possibilities, "an exercise for the student". Adjust the Period Screw to make the period more desirable. However, it is comforting to get even a wild guess of say cm/sec to volts. try to move the magnet at 1 cm/sec and see what you get. In my 1970s pre-metric dayze, I usually got about 0.5 volts when moving the pendulum at 1/2 inch per second. The June 1953 Amateur Scientist a schematic of a vacuum tube amplifier with 30 ufd coupling capacitors and 5 meg grid resistors - but you don't want to deal with that !! I used the 741 op amp in the 1970s, great in its day, but by current standards had large offset (to be manually adjusted out), high temperature drift, and high input current. 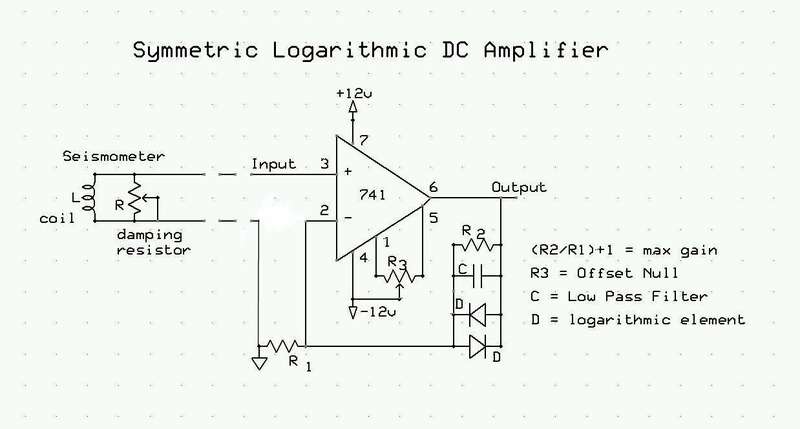 I used a non-inverting logarithmic amplifier circuit similar to this. Values are not shown as this is not a construction article. This non-linearity permits recording regional as well as distant earthquakes without going off the recording surface or throwing ink. The disadvantage is difficult calibration. Oddly, the interpretation does not suffer much. The peaks are somewhat flattened, but the general form is shown. I tried to make a notch filter that would reduce the amplitude of signals in the 1/5 to 1/10 Hz region. In the analog world this requires high ohmage resistors and "large" non-polarized capacitors - along with amplifiers of much higher input impedance than the 741 op amps. At the time, Radio Shack was selling counterfeit FET input op amps (relabeled 741s) which gave me fits. When I went digital I didn't even try to make a notch filter program. In either case, pay attention to the application notes, and also use twisted pair wires from the seismometer to the electronics to reduce noise and hum pickup. Shielded twisted pair is even better ;-)) Using a connector at each end eases handling and transportation problems. I am assuming that you don't want to become an electronics bug complete with soldering iron, so lets just buy an already made board with components already installed and tested, with output to your PC for easy recording and possible post-processing the seismic activity you collect. Larry Cochrane of the Redwood City Public Seismic Network has designed and sold ready made electronics for years. He also links to free PC software that operates this equipment and records and presents the seismic information. I'm stressing digital output because the continual changing paper and other servicing of analog outputs is really a drag !! Maybe once a week, the amplifier would have an odd periodic offset about 6 times a minute, for maybe 10 or 15 minutes, then back to normal. Finally I correlated this effect with the position of big Air-force antenna atop Mt Umunhum, about 10 miles away "as the crow flies". - lower the rotating main beam of the big antenna to its probable minimum. The effect could be considered my bad - my little DC amplifier, with diodes, was completely unshielded. Even worse, the construction was not compact - the wire leads of the 741 were unclipped, just tack soldered onto what ever components it was connected to. The diodes were in a chain, I didn't want to clip any lead so that I could make changes, on the cheap. 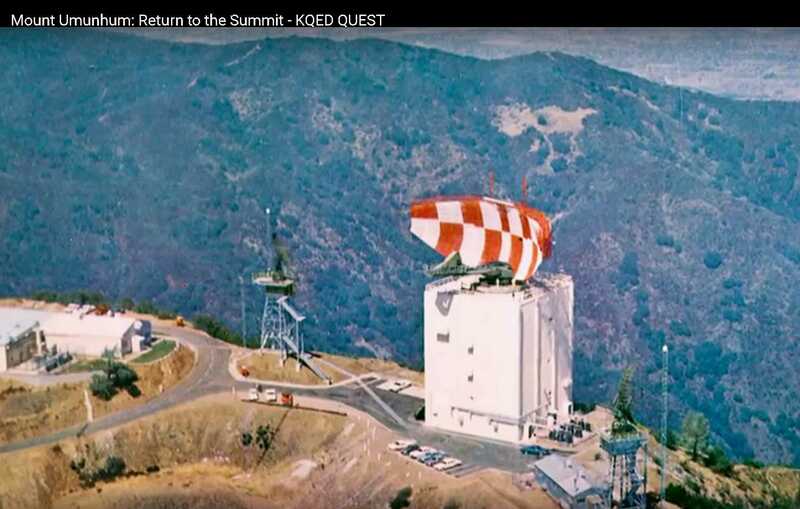 After say 1980, there was no more of this type of interference - apparently the threat from Russian ICBMs was deemed greater than from bombers that could be seen with these radars, and the Mt Umunhum Air-force station deactivated. 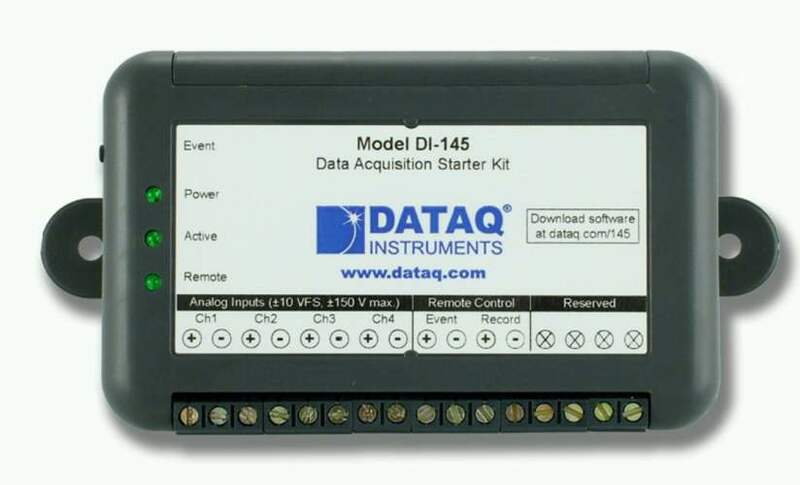 2) buy an old separate computer system, and put in the above "app"
using this works for me for another purpose, I don't seismology any more. 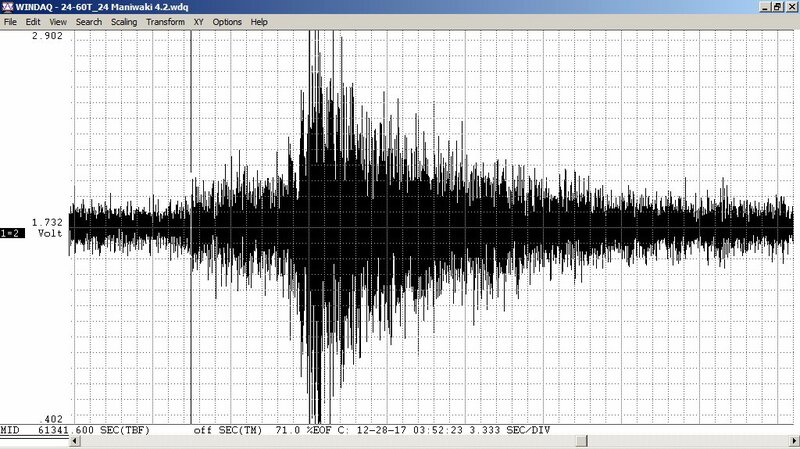 Larry Cochrane of the Redwood City Public Seismic Network links to free PC software that operates his equipment and records and presents the seismic information. 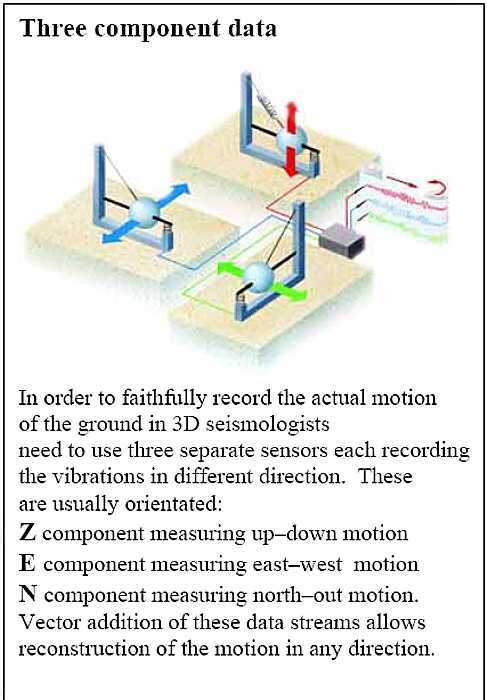 Lyle Denny of Michigan constructed a seismic system based on this web site. 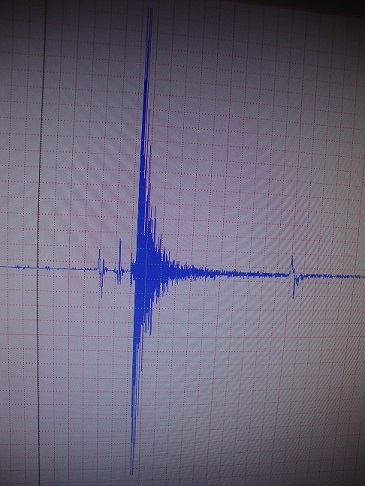 b) Data Logging, showing and saving seismometer output on your computer. "an amateur looks at professional needs and equipment"
Science is all about measurement. Professional papers need facts to help support theories. RC coupled circuits are especially suspect. Local earthquakes can easily sent these horizontal instruments we have been talking about off their physical scale. The boom of the instrument has been pushed into its stops, the instrument has probably slid and been knocked about a bit. Guessing at the dimensions, I estimate 3 inches diameter, 5 inches long. I forget if the magnetic structure or the the wire wound solenoid was attached to the boom. I do remember the wire was a larger diameter than I expected - maybe #32 enameled wire. Note that for most of the travel of the solenoid in and out of the magnetic structure, you can expect a rather linear change of magnetic flux per millimeter of movement. I imagine that the pole pieces could be tapered to improve linearity. The equation (not including fringing effects) for the magnetic flux change through the coils per millimeter of offset from this position is unpleasant, but definitely non-linear. If we calibrate carefully with the components in say this position, and the components shift due to changes in leveling, then the calibration is no longer accurate. This limits the usefulness of our data for serious seismic work, such as velocity or displacement estimates. I thought you might like to see my home brew seismometer. So here is a series of photos. You can see the LED and photo cell arrangement. The graphic is of a 4.5 mag earthquake that occurred about 60 mile south(near Galesburg Mi) of my home on May 2, 2015. It was a classic wave form, you can see all the elements of the wave. The boom is suspended with a guitar string. I let the five pound mass hang on it for two weeks to get the stretch out of it. On the end of the boom I have a pan of mineral oil and a paddle for a damper. I have almost zero maintenance. Twice a year I take my laser level and check the boom for level and the offset of the pivot points to be sure I have 1mm offset. It is hard to get the offset as I use a ball bearing on a flat surface for the top pivot, but it works. I added 50 pounds of lead to the base to increase it's sensitivity and it did. 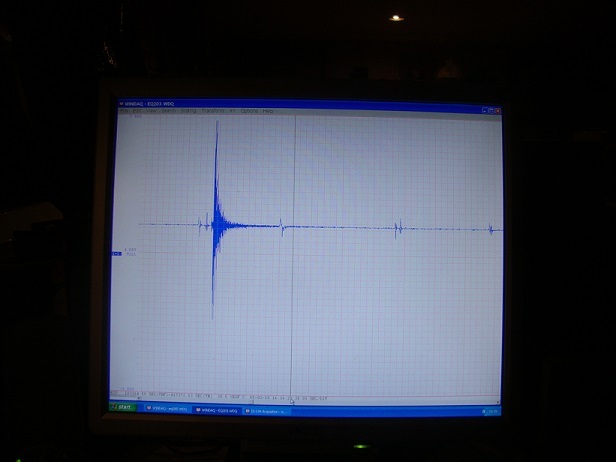 The seismometer is in my old basement shower room away from drafts and other interferences, foot traffic. You can believe this or not but when someone walks around upstairs the house and foundation tip and this thing will detect it and when strong winds come along same thing will happen. I have been very satisfied with it's performance or the years. Thank you for putting up with me as there isn't many people that have this boring hobby. How are you? I am 63 and retired. 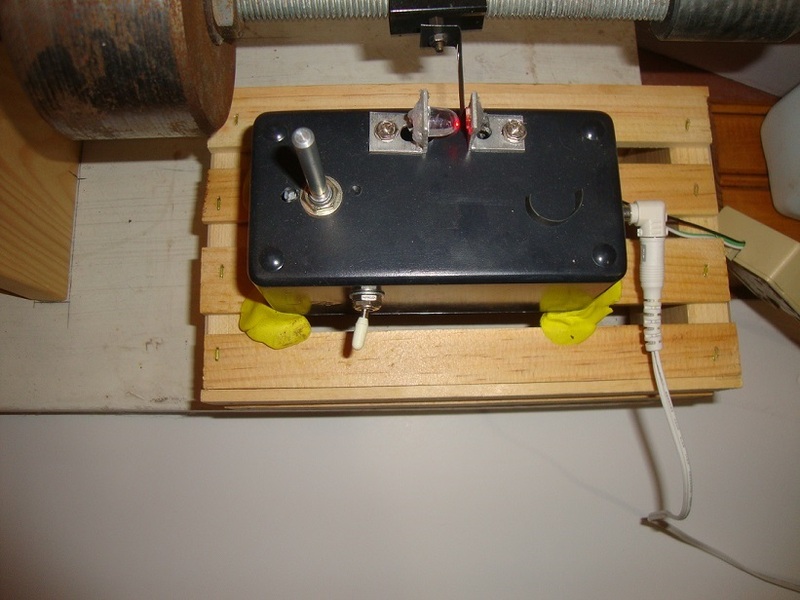 Over the years I have tried spring and weight for seismograph.... magnets and coils etc. But I wanted smaller and more sensitive... So, I took a 2 inch piece of lab rubber tube, plugged at one end with bleeder hole and with an electret microphone capsule at the other end. The rubber tube provides spring and damping all in one. The end of a cylindrical 400 gr weight rests horizontally across on it. There are a few problems with my station. One is the city noise. The other is baroms or infra-sound. The detector being a pressure sensor, I have to distinguish what is due to ground movement from infra-sounds . So I have a second tube and microphone without the weight that I record on a second channel.